Key component for this plan is XMuLator, from Charteris, Ltd. Charteris is looking to sell the program wholesale to a company like Sun. It models all markup and RDBMS to one central model. 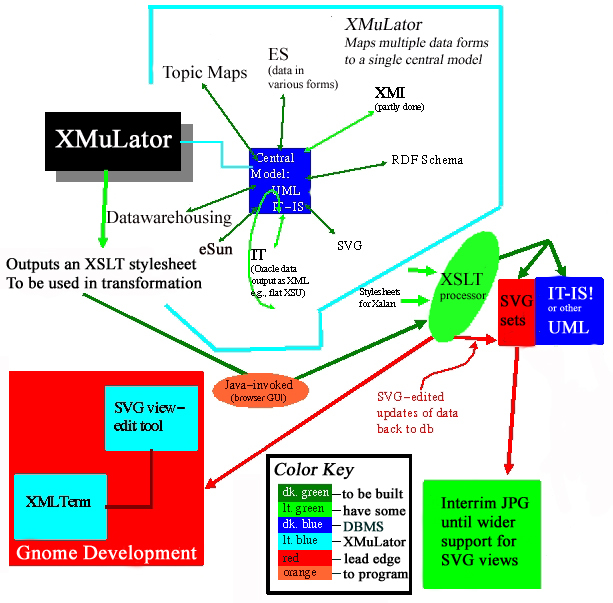 Anything mapped to that model can, in turn, be transformed with XSLT (which is what XMuLator creates to facilitate transformation of mappings) to any other format mapped to the central model. This simplifies the logical structure issues of data warehousing from multiple and differing formats and schemas. Interface is tree-based GUI, drag and drop customizable mappings. Ability to resolve impedance mismatch--densely demarked data verses loosely (cf. names example on previous slide narrative). A suggested resource would be IT-IS!, and a sample model of XMuLator and IT-IS! technology is suggested by this deployment example.